To achieve that, the SA-10 is a completely new design, drawing on all that experience in making great-sounding players but with virtually every part redesigned. That involved both innovation and some unique thinking, all in the cause of getting the best possible performance across a wide range of digital audio formats. The new model is an exceptional player of both CD and SACD discs, but can also play high-resolution music stored on computer-burned discs, as well as being a high-end digital to analogue converter for computer-stored music. 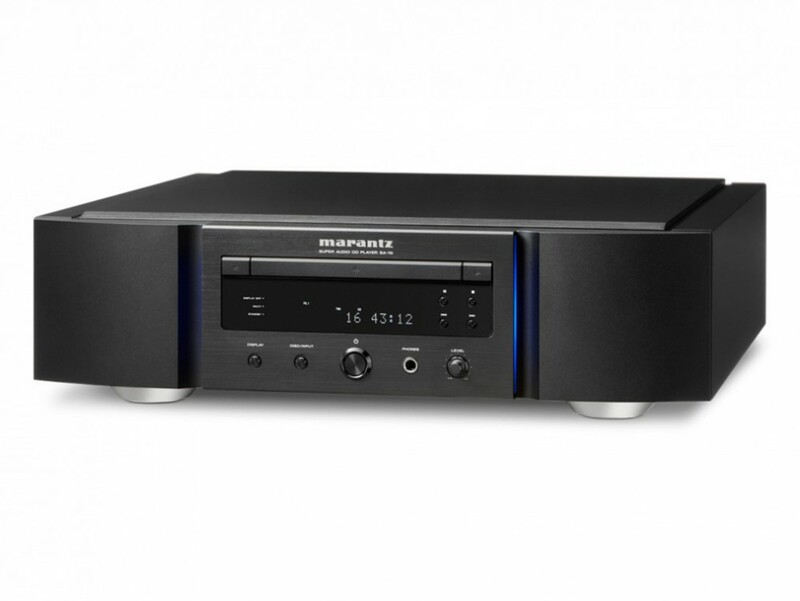 From the unique new disc transport designed for this player all the way through to a complete rethink of the way digital audio data is converted into analogue signals, the SA-10 is a ‘clean sheet’ design, the result of painstaking research and development and extensive listening in Marantz’s custom-built listening facilities. That’s symptomatic of the way Marantz has always done things: while it always aims for the most elegant engineering solution, the listening test is always the final arbiter. It’s all to do with that simple phrase running through the heart of everything the company does: ‘Because Music Matters’. Whether playing SA-CD or CD, or data discs containing music, it’s vital that any player retrieves the information as accurately as possible: unlike a computer reading a disc for ripping, there’s no time for repeated re-scans when playing music – it happens in real time, so the disc transport needs to get things right first time. Many modern CD and SACD players use computer-style DVD or ‘universal’ disc drives, simply because it’s increasingly difficult for manufacturers to source dedicated ‘music drives’, purely designed for SACD/CD playback. 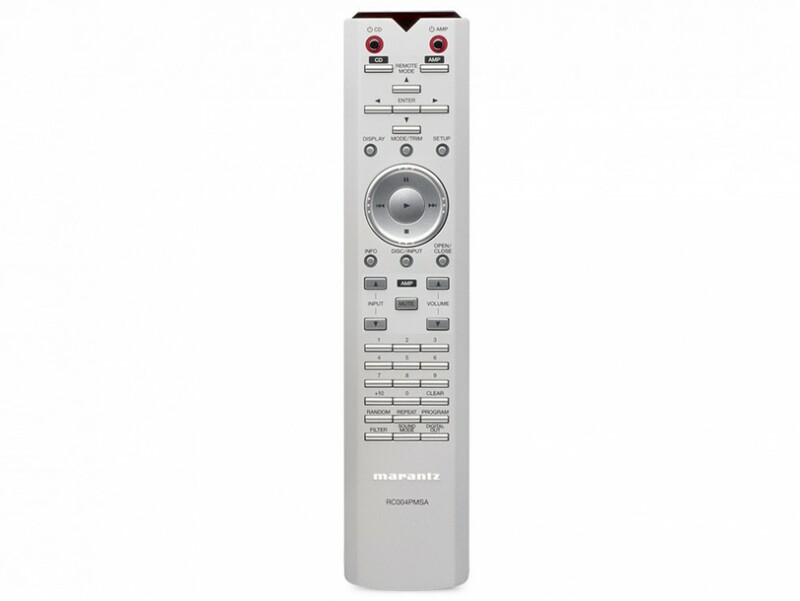 The Marantz solution? If you can’t buy it off the shelf, design it and have it made: at the heart of the SA-10 is an all-new SACD-M3 transport mechanism, engineered solely for the best possible performance when playing SA-CDs, CDs and music stored on data discs. Not only does this new mechanism promise the very best sound quality from conventional CD and SA-CD discs, its extended ability with the playback of music files stored on DVD-ROM discs makes it possible for users to create their own high-resolution audio compilation discs using a computer DVD burner. The SA-10 can play FLAC files from 32kHz to 192kHz at up to 24-bit resolution, and DSD64 and DSD128, well as ALAC (Apple Lossless), AIFF and MP3 files. That means making and playing hi-res disc compilations is now just as simple as it’s always been to make such discs in CD quality. However, the SA-10 goes so much further than just disc playback: it’s also a fully-functional digital-to-analogue converter for music stored on a home computer, as well as having conventional digital inputs for existing source components. 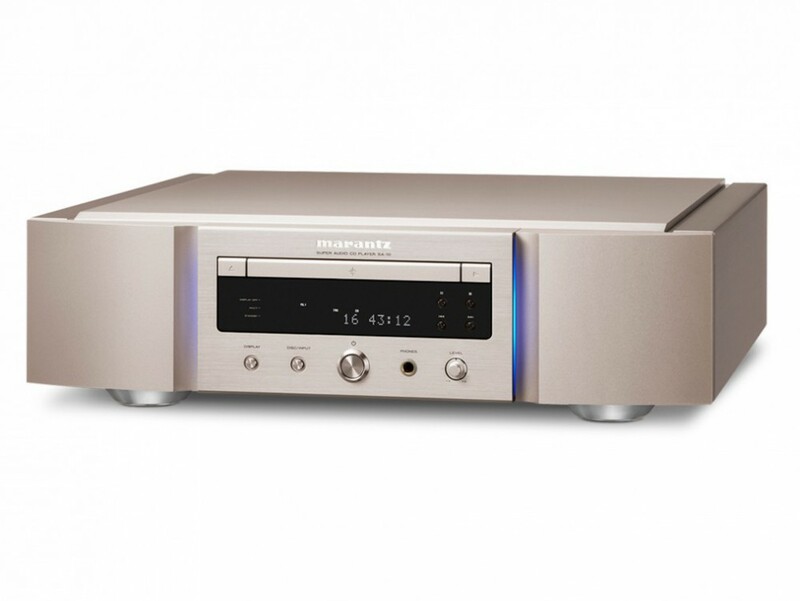 Those conventional inputs – optical and coaxial – can handle files at up to 192kHz/24bit, but in addition the player’s digital input section includes a USB-B asynchronous input for the direct connection of a computer, and this is compatible with PCM and DXD music files at up to 384kHz/32bit, as well as DSD64, DSD128 and DSD256. What’s more, the digital input section is completely isolated, to avoid any electrical noise from connected components – a particular problem when computers are used as a source – from finding its way into the signal-path. CD players (and indeed amplifiers) with built-in DACs usable for computer audio are nothing new, and neither is DSD capability on such devices. 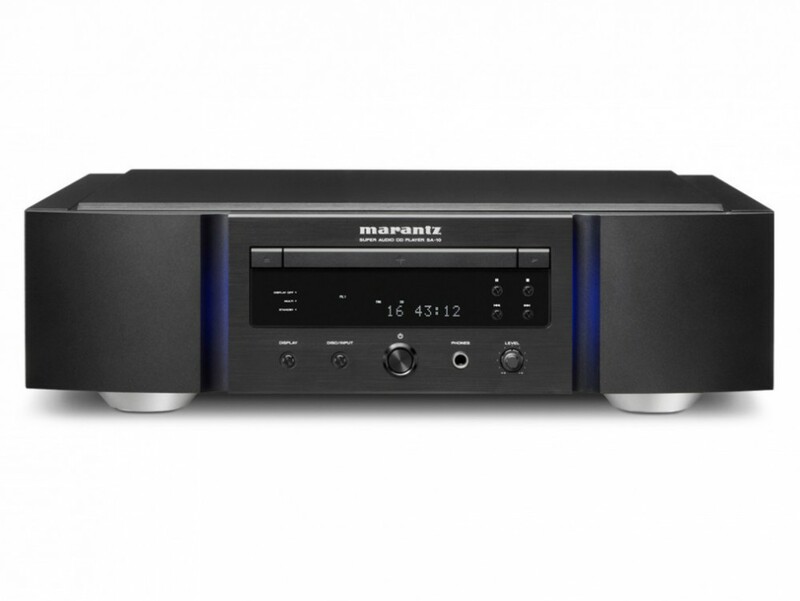 Indeed, the Marantz range already has several CD/SA-CD models so equipped. 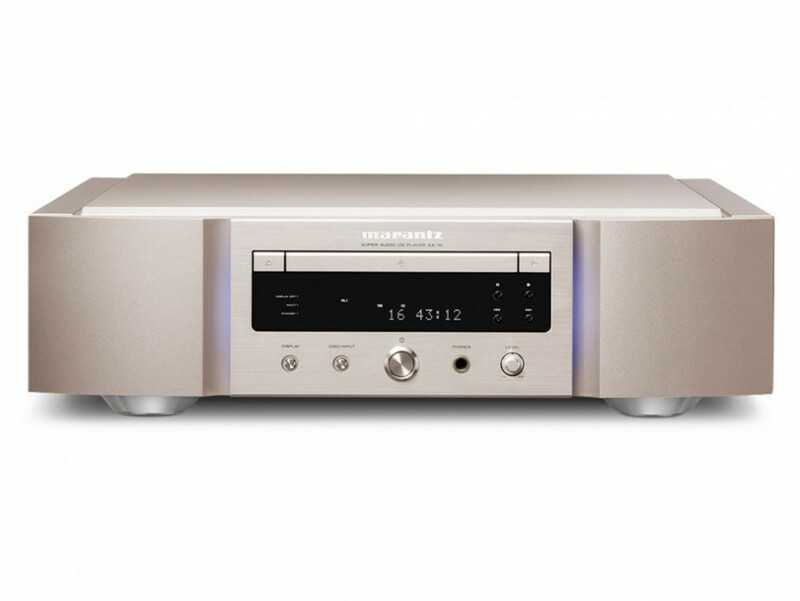 However, the SA-10 takes things further – just as it features an all-new disc transport mechanism, so the digital to analogue conversion has also been subject to a radical rethink, taking full advantage of the 1-bit conversion technology found in past flagship Marantz players, and incorporating brand-new filtering and upconversion to take advantage of this simple, but elegant solution. DSD is at the heart of the way the SA-10 handles digital audio: PCM and DXD inputs are all upconverted to DSD at 11.2MHz using the proprietary MMM-Stream converter within the player, and then the high-frequency signal produced is processed by the unique MMM-Conversion stage, used in place of a conventional DAC, to produce the analogue output. The MMM-Stream section of the process replaces the oversampling filters normally used in digital to analogue conversion, and allows the implementation of the Marantz Musical Mastering filtering. These filters – one providing a slow roll-off and very short impulse response, the other offering the option of a medium roll-off with short pre-ringing and longer post-ringing – are essentially the same as those found in the Marantz SA-11 disc player and NA-11 network music player, but here they’re implemented at a much higher oversampling rate, thanks to that upconversion to DSD11.2. In fact, two system clocks are used, to ensure the most accurate upconversion of the incoming signal, whether its from disc or the digital inputs: the 44.1kHz of CD, and its multiples – 88.2kHz, 176.4kHz and so on – are upsampled to 11.2896MHz, while 48kHz and its multiples are taken up to 12.288MHz. This is done for maximum precision, and to avoid any need for sample rate conversion of the kind were the system to have to convert, say, 192kHz audio to DSD11.2. Combining this with the reduction to a 1-bit signal straight after the oversampling filter and Sigma Delta Modulation allows a pure DSD-standard signal to be passed to the conversion section in the form of a very high-frequency stream of pulses, requiring only a very high-quality low-pass filter to remove all the superfluous high frequencies and pass the purest possible audio to the player’s output stage. So why develop all this in-house? 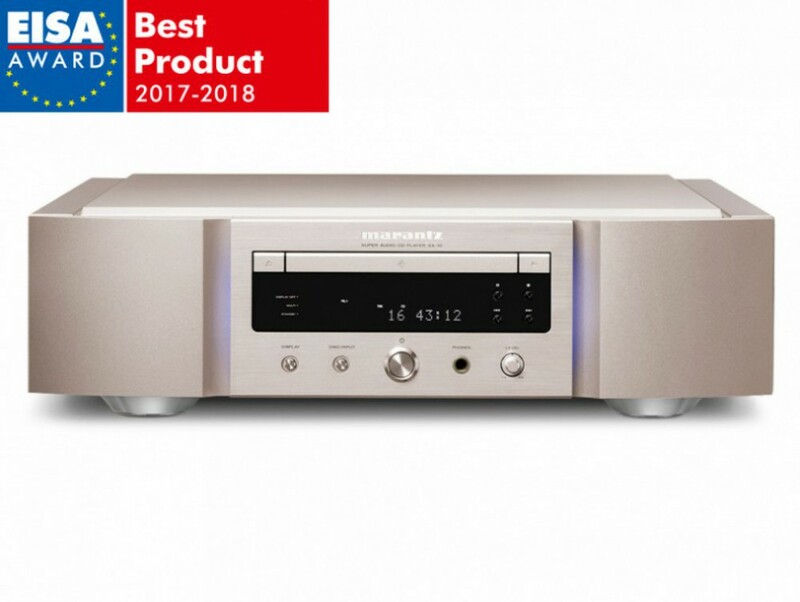 The Marantz engineering team says that, as ever, extensive listening sessions gave the reasons: ‘We found big sound quality differences when PCM signals got converted to DSD outside of a conventional DAC and then fed to the DSD input of the conventional DAC. The conclusion of our finding was that for best sound quality we have to do the conversion ourselves. The same thinking informed the design of the DSD-to-analogue filter itself, which feeds into the familiar Marantz HDAM (Hyper Dynamic Amplifier Modules) in the output stage, here used in dual-differential configuration for optimal sound quality. In the same way, even the headphone output on the player is optimised: like the HDAMs, it’s built entirely from discrete components, rather than using simpler ‘amp on a chip’ technology, for the very best sound quality. 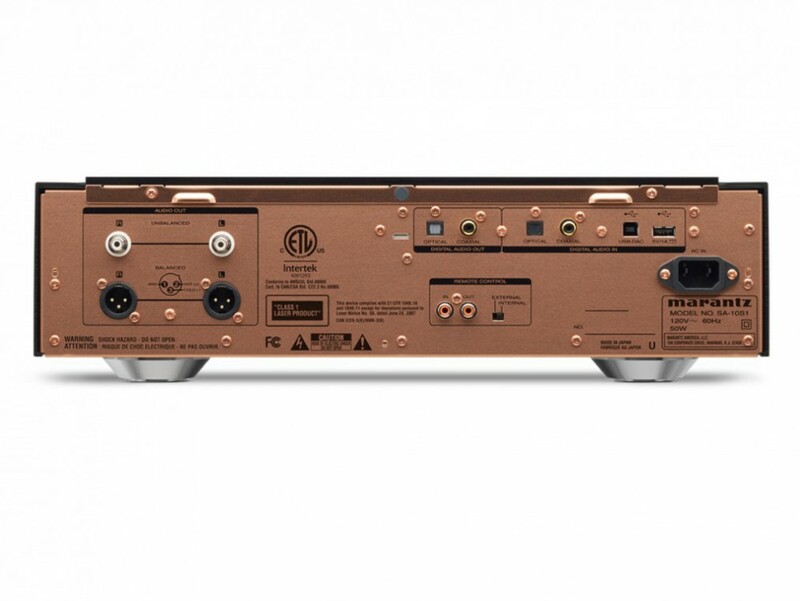 Like the partnering PM-10 integrated amplifier, the SA-10 is constructed to the highest possible standards, with a double-layered copper-plated chassis for excellent rejection of mechanical and electrical interference, and casework constructed from thick non-magnetic aluminium panels and 5mm thick top lid. Both products also sit on aluminium die-cast feet.